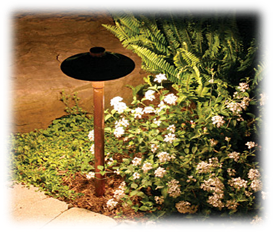 Outdoor lighting will enhance the beauty of your yard with lasting impressions. Whether it’s a spot light for a water feature, soft radiance for shrubs and gardens, or navigation for paths and driveways, illuminating dark shadowy areas will create a stylish nighttime ambiance for everyone to enjoy. Put a little twinkle in your night life.